Goldeneye in HD at last! In the ancient history that was NYCC 2010, we were walking along, checking out the various games being shown off, when we saw a neat display for Goldeneye on the Wii. It looked like a stereotypical bedroom from the 1990s and evoked an almost paralytic level of nostalgia for the game that introduced the console generation to first person shooters. When the game came out, we even picked it up… and then put it down. It isn’t that it wasn’t good. It was excellent. The problem was that the Wii, for all of its strengths, just isn’t a graphics powerhouse and is positively dismal when it comes to online multiplayer. Granted, the original Goldeneye looked like papercraft action figures shooting at each other and only sported split screen multiplayer, so the Wii should have been just fine to recreate the experience. Nostalgia can only carry a title so far, though. There comes a time when you have to add in the progress of a few generations of hardware and infrastructure. And that time has come. Freshly announced is Goldeneye 007: Reloaded. Think of it as the remake of the remake, providing you with XBLA or PSN connectivity and current gen visuals. They even promise a 60 fps experience, which is a refreshing dedication to smoothness. Early indication is that this game is getting a little extra push on Sony’s platform, thanks to full Move support. You can find the whole press release below. Details can be found at www.goldeneyegame.com. SANTA MONICA, Calif., July 20, 2011 /PRNewswire/ — The world’s most famous secret agent is back! Activision Publishing, Inc. (Nasdaq: ATVI) today declassified the existence of GoldenEye 007: Reloaded, which will make its grand debut on the PlayStation®3 computer entertainment system and Xbox 360® for the first time ever. 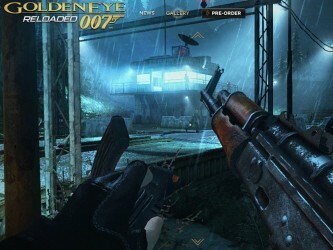 Built on a brand new engine that delivers striking visuals, blistering fast gameplay and the ability to play using the PlayStation®Move with Sharp Shooter peripheral, GoldenEye 007: Reloaded is the complete James Bond experience shooter-fans have been waiting for and will launch in stores later this fall. GoldenEye 007: Reloaded is a contemporary James Bond experience featuring HD visuals and realistic environments running at 60-frames per second, akin to today’s elite action games. Additional to the legendary story campaign, the game introduces the brand new ‘Mi6 Ops Missions’ — new, distinct levels separate from the campaign that span the varied environments from the story and challenge players to complete different Assault, Elimination, Stealth and Defense objectives. GoldenEye 007: Reloaded also takes multiplayer to new heights, maintaining and improving its renowned four-player split-screen action and adding full, adrenaline-pumping 16-player online matches with more maps, weapons, characters and game modes than ever before.